To collect our fabulous inner fortune. When was Jesus born? or What is Jesus' birthday? It transpired that the excellent RE head of department who had been working there for several years had repeatedly flagged up some urgent action which was needed. This had been ignored and ignored. Finally, in total frustration, he gave his notice at the last possible moment and left the department looking as if a tornado had struck, with every file and drawer of papers and books in the book cases tipped upside down. It was a real baptism of fire. But my first challenge was not within my classroom. First thing, on my first day at this school, I was asked to supervise a hall full of year 9 pupils who were waiting for - or returning from an inoculation. I think it was for TB. I had not been teaching for very long and you can imagine that I was daunted to step into a room containing hundreds of very rowdy and seemingly mostly hostile and disaffected young people. There were 5 or 6 classes I think - mostly boys, mostly taller than me. I was alarmed and at quite a loss as to where or how to begin engaging with them. Since we had all just returned from the Christmas holidays, for the sake of conversation I asked some lads who were near me, if they knew when Jesus was born - what his birthday was. They treated me like a dummy and said 25th December of course. When I challenged this answer and suggested it might be just a convenient date that the Church in many countries has chosen on which to celebrate the birth of Jesus – and even this date has changed from time to time in history - and that some churches celebrate Jesus' birthday on other dates - they practically lynched me. I was going against everything they had ever learned. I had certainly attracted their attention. Word spread like wildfire and the hostile crowds gathered in quite a threatening way. Seemingly I was challenging their collective beliefs in a way that resembled ‘mother cussing,’ by suggesting that something they all knew and agreed to be true, was mistaken. They were not pleased at all. At least I had the attention of nearly everyone in the room – so nobody was inclined to get into mischief. I remained calm and good natured, while inwardly offering some serious pleas for protection and help. I asked how they knew that Jesus was born on 25th December. They said that they had known it since they were young. Their parents told them and the Church people told them. It was something that everyone knew. I have no idea whether any other staff or management passed by to wonder what was going on, but eventually I was saved by the bell. Because of the intensity of interest that this incident and topic aroused, and because nobody had believed me and I wanted to re-establish some authority by proving my point, year 9 spent the whole term exploring the issue of Jesus' birth - the date, the year and the variety of ways in which Christmas is celebrated around the world. It was a fascinating journey. By the end of the term if you asked any member of year 9 when Jesus was born, they would say, ‘I don’t know. Nobody knows.’ The more interested and able students would have continued, explaining that we celebrate Christmas at mid-winter because the early Christians chose that time. There were many good reasons for this – and it was not just because the local people already had a major mid-winter festival that they did not want to give up. The mid-winter festival was called Yule by Germanic and Nordic people. It was associated with the god Odin and the ‘Wild Hunt’ - celebrated with warm fires and feasting, burning traditional yule logs, decorating homes with evergreen plants such as holly, ivy, mistletoe. Pine-trees were also part of the Yuletide festival. Christians embraced many of these symbols and traditions and gave them new meaning, linked to the Christian story. The mid-winter festival was important to sun-worshippers who celebrated it just the after the winter equinox (21st December) when the days slowly begin to lengthen again. They viewed it as the victory of the physical sun over the cold and dark days of winter. Christmas celebrates the birth of the Son of God, the Light of the world. Teachers can draw out the theological links between these two philosophies – which may well have influenced the early Christians in choosing this as a good time to celebrate the birth of Christ. Yuletide is mostly about outer physical events - a change in season, as the days begin to lengthen and despite the cold, there is the hope of warmer days ahead, new life and rebirth in spring. They celebrate with outer activities such as feasting and exchanging gifts. In contrast, for Christians Christmas is mostly about inner qualities. Christians wonder and rejoice that in Jesus God chose to come into our human world, as a fellow human being, but unlike us, he was fully divine too. In the gospels he speaks of being the Way, the Truth and the Life. This was a cosmic event, not just the regular pattern of the seasons. His victory would not simply be over physical cold and dark, but heralding an inner victory of love, spiritual light, peace, forgiveness and sacrifice over the darkness of the forces which divide people and evils such as greed, cruelty and death. There is a wealth of opportunity for discussion – linking with many events in our world today here. So for Christians, Christmas tends to be as much an inner event as it is the traditional time for feasting and having fun. Christians rejoice in the coming of Jesus into the world and worship is central with carol-singing and attending the Midnight Mass extending to those who rarely take part in church services during the rest of the year. Christians draw attention to the way that in Jesus God chose to be born - not in a palace, with all the comfort and ceremony that might attend the birth of a prince in a traditional kingdom. In contrast, Jesus was born a nobody - almost un-noticed, homeless and destitute, with the company of local herdsmen, as his first guests. Christian theology recognises that Jesus, by choosing a position at the bottom of society, was able to embrace and include even the most marginalised, poor, helpless, forgotten and vulnerable people of his time. In this way everyone, could feel that Jesus was with them and for them. In this way Jesus could become a true friend and ‘saviour’ for all the world. 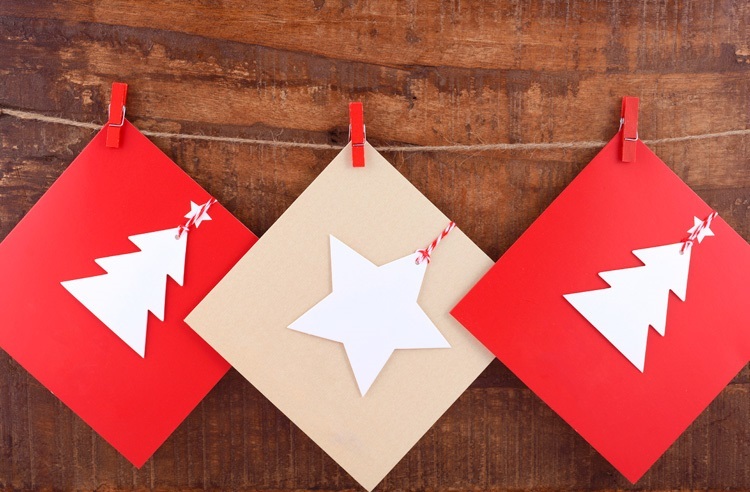 I will later give a link to some resources which will help you to engage with this topic in your lessons, but I returned to this tension between inner and outer Christmas just a few days ago in an unexpected way. I have a friend who sells the Big Issue and last Friday he asked for my advice. He wanted to enter a Big Issue competition for designing a Christmas card. The topic was ‘The colours of London’ and he wanted to include images relating to the Big Issue Magazine – John Bird (the founder, one time homeless, now a Baron in the House of Lords) his own image, selling the Big Issue, with its slogan ‘give a hand up, not a hand out’ and the character of Bob the Cat, now made famous by the film. He also wanted to include images of London. He had tried a few ideas out but none worked as he wished – and he had no paints or colourful art materials. Knowing I am an art teacher as well as an RE specialist he brought the project to my attention and we had a lot of fun trying things out. I lent him some crayons which are actually ink, so when you spray water on the finished picture the colours jump out. He has now submitted his entry which has worked well from an artistic perspective but has only passing reference either to the events of Yuletide or the birth of Christ. 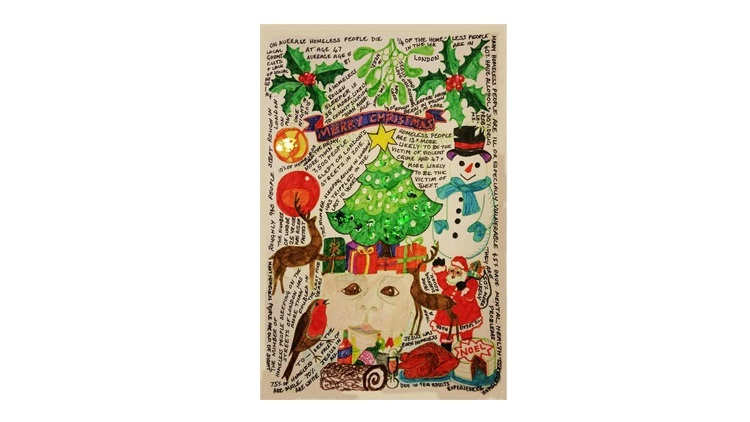 Impressed with this entry and inspired to submit something himself, one of his Big Issue friends went on to design his own card which I find quite moving from an RE perspective as well as being artistically successful. He researched homelessness in London and added written statistics to a card dominated by traditional ‘Yuletide’ images – but with the face of a child looking out between the bottles of booze, the cheery robin’s song, Father Christmas’ reindeer and boxes of presents. His entry used ordinary felt pen and crayon with some added glitter, but it was not simply about having fun at Christmas time. It also made you think. I will share these two designs here and encourage you to spend a lesson with all your classes discussing the complex nature of Christmas – the inner and outer significance, the Yuletide and Christian contributions - and setting a homework challenge to design a Christmas card which engages both with the pre-Christian Yuletide festival and with the Christian Christmas story. You can encourage your pupils to research and choose a topic that they think Jesus would be concerned about if he was physically alive and walking the earth with us now. They may like to include writing too. My photos of the two cards were taken in a rush and are not great. The first one was a bit blurred, so I have cleaned up the colours in the big lettering. The second card had writing right up to the edge of his card, and the card itself was a bit bent and curled. I have added a narrow border to make the writing easier to read - but because of the curl in the paper this comes out wider in some places than others. I hope you will find this topic-outline with the pictures, helpful to share and discus these with your classes before setting a card-design exercise – and that you get some really interesting and thoughtful responses. Best wishes and love for a very happy Christmas. Durga-Mata is an art and RE specialist.